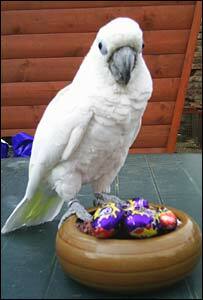 Her owner, Geoff Grewcock, said: "She went straight over, climbed on the creme eggs and that was it. She thinks they're her eggs. "Until she clicks they're not real eggs, we'll just leave her there." The 17-year-old cockatoo, who has been at the sanctuary for about four years, is expected to live until the age of 70. Pippa is one of 300 birds at the Nuneaton sanctuary, which also has 50 animals. Mr Grewcock described her as "very, very protective" and she had been through a "maternal stage". He said: "She picked an egg up and threw it at a photographer with her beak as if to say 'leave my eggs alone. They're mine'. "She's got so much character it's unbelievable. She hates men - we've had a builder in who had his neck bitten. We had to prise Pippa's beak off his neck. "When she attacks you, she attacks your ear lobe - she goes straight through them. We do free ear piercing here. "She's ever so comical - always has been."